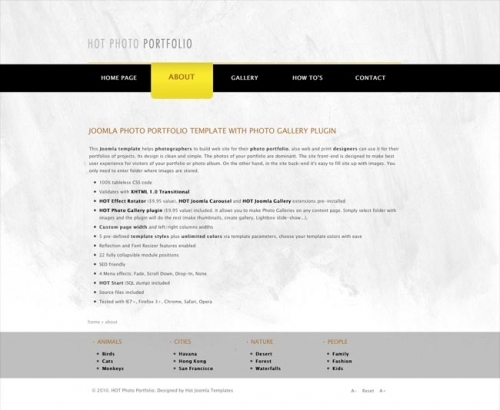 Photo Portfolio template is a responsive Joomla template that can help photographers and designers to build their portfolio websites. It's based on clean and simple design. The photos of the artist's portfolio are dominant. 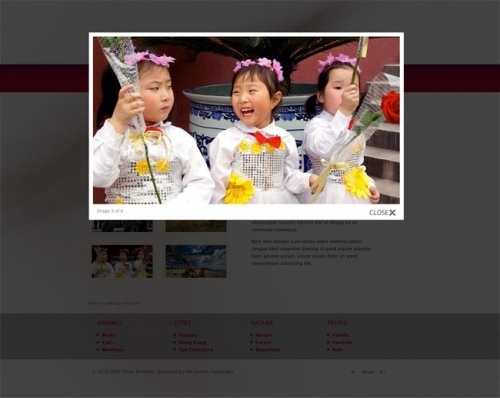 The site front-end is designed to bring the best user experience for visitors of the portfolio or photo album pages. On the other hand, in the site back-end, it's easy to fill the site up with images. You only need to enter a folder where your images are stored. 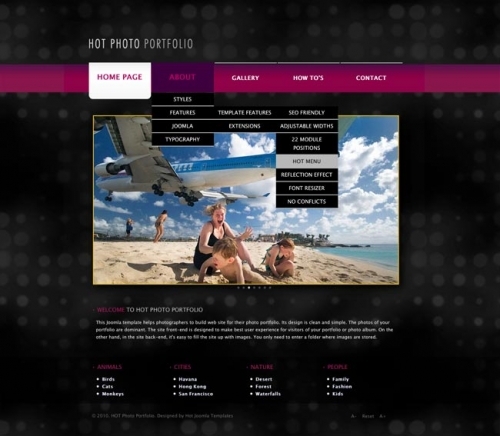 Photo Portfolio template has been updated on June 2015. After so many requests from our clients, we made it responsive and HTML5 compliant. 100% responsive and valid HTML5 and CSS3 code. This template is responsive in version for Joomla 3 and above only. 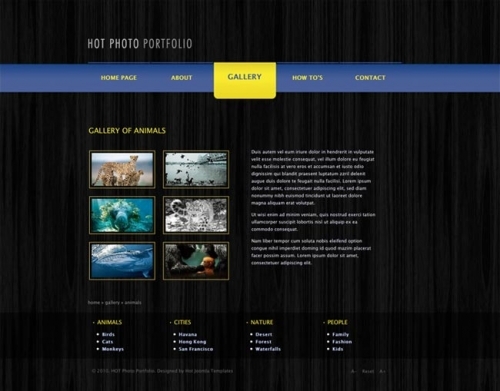 Responsive Hot Effect Rotator ($15 value), Hot Joomla Carousel and Hot Joomla Gallery extensions are pre-installed. 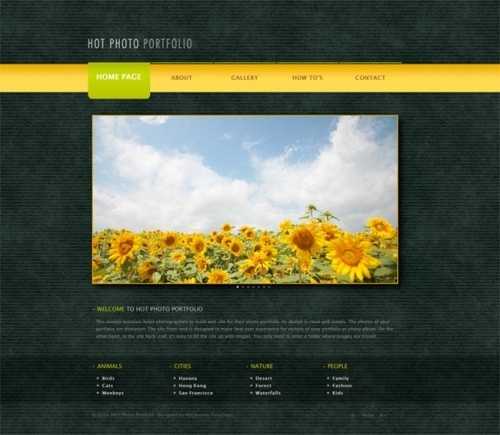 Hot Responsive Lightbox plugin ($15 value) is included. 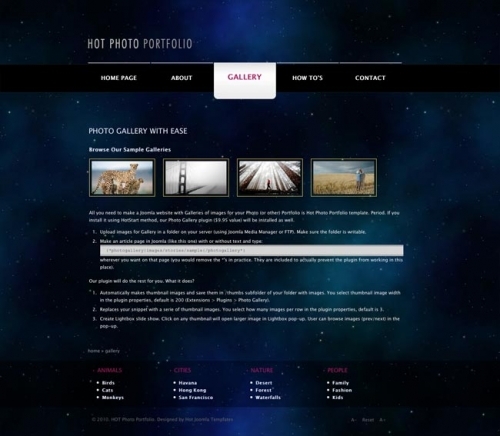 It allows you to make some photo galleries on any content page. Simply select a folder with images and the plugin will do the rest (make thumbnails, create gallery, Lightbox slideshow, etc.). Parametrized page width and left/right columns widths. Tested with IE7+, Firefox 3+, Chrome, Safari, Opera. Tested on iOS and Android mobile devices.